Daylight savings time begins this weekend, meaning the days will be longer and spring is beckoning. And so we celebrate with a plant show, a gardening conference, new art by young artists, new music by local musicians, dance, theater, and more. Here are some highlights. The Garrison Players Arts Center in Rollinsford opens its 2018 season with a production of Neil Simon’s farcical play, “Rumors.” The plot revolves around the deputy mayor of New York shooting himself (non-fatally) on the night of his 10th wedding anniversary, leading to a messy gathering. The show opens Friday, March 9, and runs through March 24. Show times are Fridays and Saturdays at 8 p.m. and Sundays at 2 p.m.; tickets are $15 to $18. Learn more here. Though we are buried in snow, upcoming events portend the approach of spring. 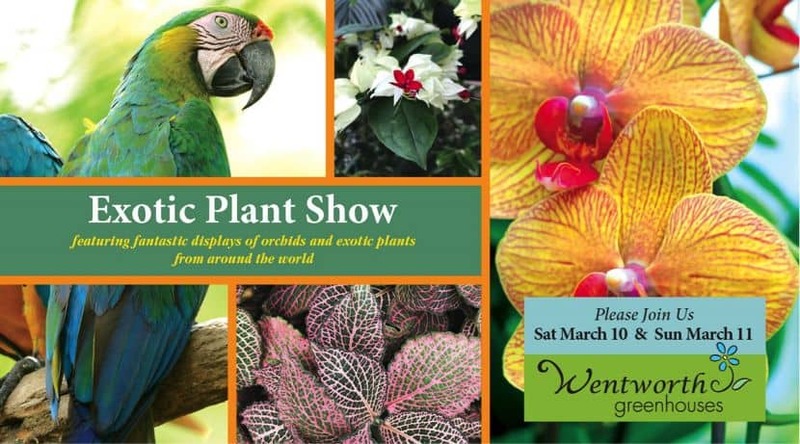 On Saturday and Sunday, March 10 and 11, Wentworth Greenhouses in Rollinsford present their annual Exotic Plant Show, featuring displays of plants from around the world, plus animals from Wildlife Encounters. Also on Saturday, Slow Food Seacoast and Seacoast Permaculture present the fourth annual Seed to Soil Conference at the Seacoast Waldorf School in Eliot. The event includes a potluck lunch, demonstrations, workshops, and seed sharing. Two exhibits opening in Portsmouth this weekend showcase the work of young Seacoast artists. The New Hampshire Art Association presents “Fresh Perspectives,” featuring work by high school students from Portsmouth, Dover, and Winnacunnet, with a reception on Saturday, March 10, from 12-3 p.m. Also, Portsmouth Public Library presents “SPLASH! The Art of Portsmouth’s Young People,” featuring work by students from Portsmouth’s public schools. The show opens Friday, March 9; there’s a reception on Saturday, March 17, from 2-4 p.m. Sole City Dance and the Rochester Opera House unite to showcase talent ed area dancers on Saturday, March 10. The annual Dance Northeast celebration features dance companies and education centers from around the region, including senior and professional companies and special guests. There will be two performances at the Opera House, at 2 and 7 p.m., each promising diverse choreography and innovation. Tickets are $8 to $14 and there is a cash bar. For more information, click here. For the uninitiated, the RPM Challenge encourages people around the world to record an album of original music during the month of February. The annual RPM Listening Party is an opportunity to hear select tracks from locally produced albums and mingle with the musicians who made them. This year’s party takes place at the Portsmouth Music and Arts Center (PMAC) on Saturday, March 10, at 6:30 p.m. The event is free and open to the public; learn more here.